Credo is a newish restaurant in the Financial District that specializes in Italian cuisine. 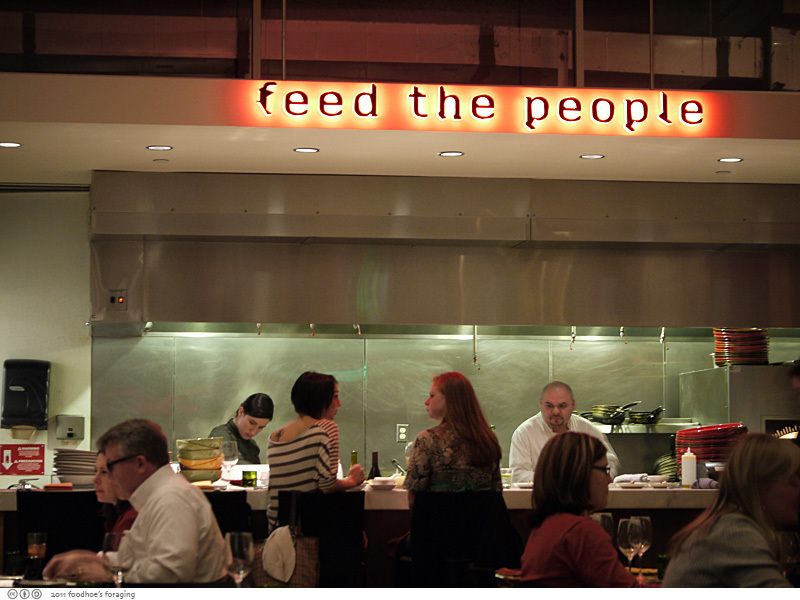 Like most restaurants, the motto is to feed the people, which is prominently displayed in glowing red letters along the back wall above the open kitchen. The walls are full of words by famous people, which I found to be delightrful as I kept trying to read the visually compelling columns of typeface. I joined my friend JT who was sitting at the bar where we enjoyed glasses of happy hour wine. 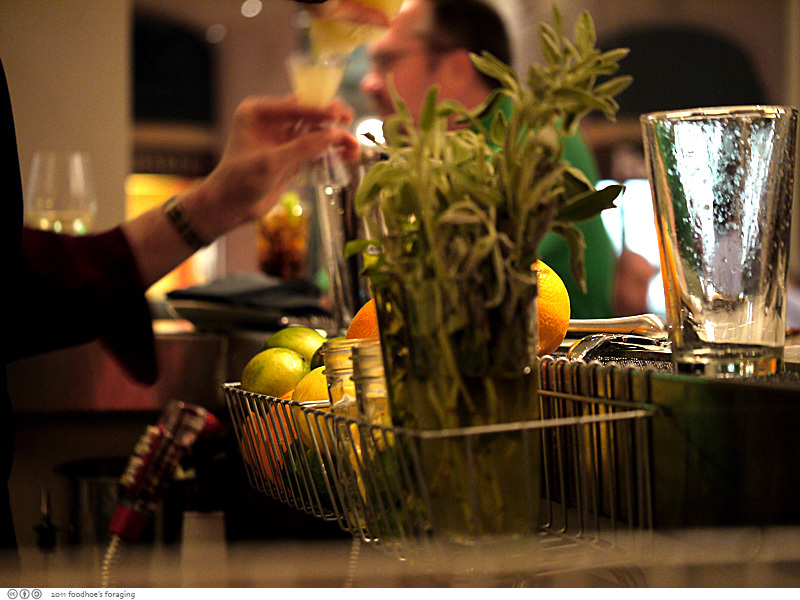 The bartendress was busy and had an intriguing supply of fresh herbs for garnishing cocktails. We waited there for our friends Daisy and P and convinced her to let us stock up on glasses of happy hour wine to take with us to our table. 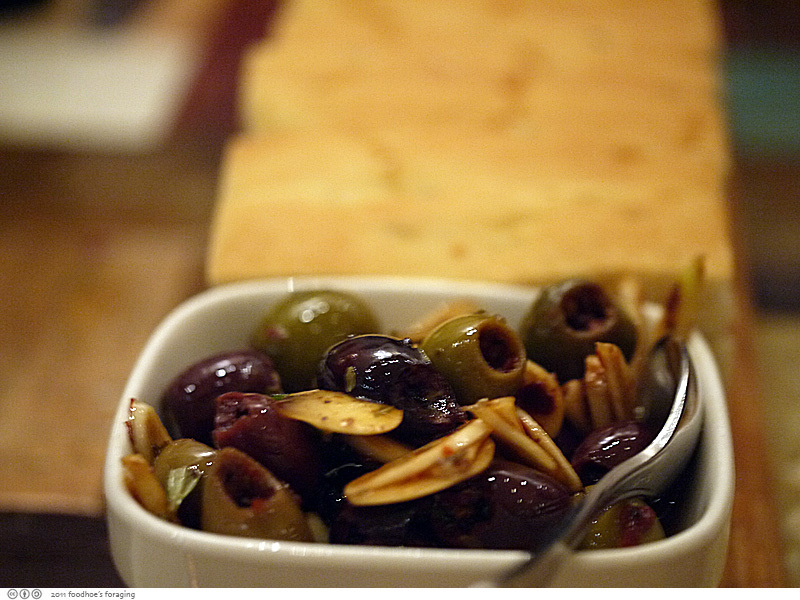 Once we sat down and ordered, we enjoyed a bowl of spicy olives which were tossed with slices of raw garlic. 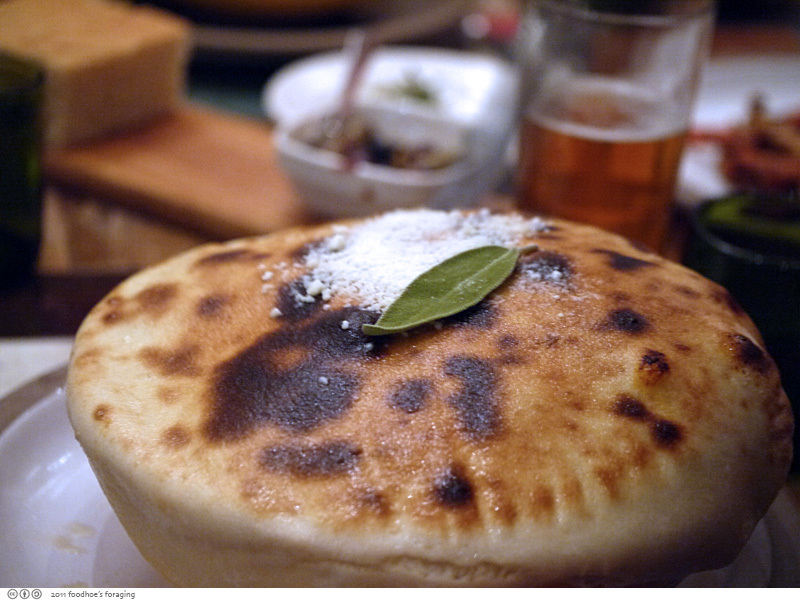 It was very flavorful and so good with the accompanying focaccia. My but those slices of garlic made tendrils of garlic flames issue forth from my mouth… fortunately we were all in the same boat! We all stuck with the Dine About Town menu, which was $34.95 for three courses, so I am not including prices for each dish… Dine About Town (DAT), if you have not heard of it, is an event where participating restaurants offer 3-course meals for promotional rates during a two week period twice a year. I missed the last one completely, so was excited to see Credo was participating and offering their magnificent sedanini on their DAT menu (more about that in a minute). 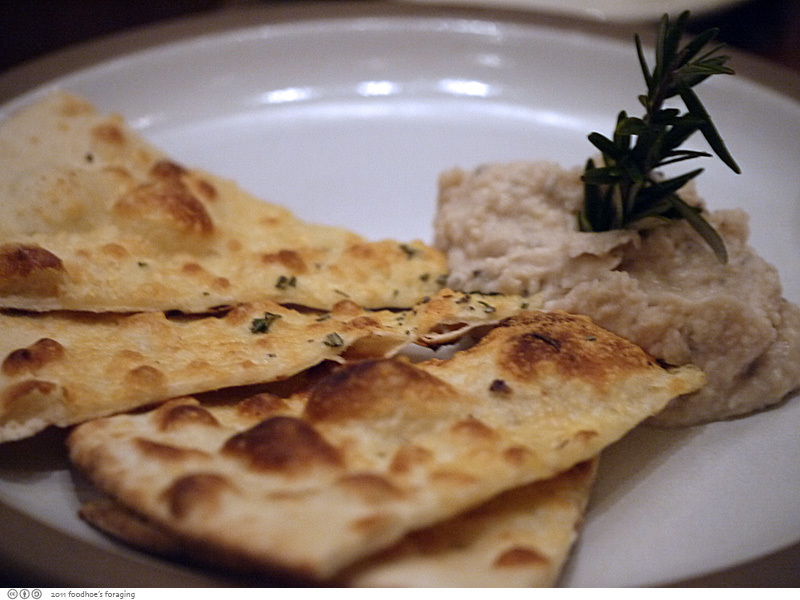 JT and Daisy both began with the Tuscan hummus with rosemary flatbread, which were greatly enhanced with those garlicky olives. The portions were very generous too. 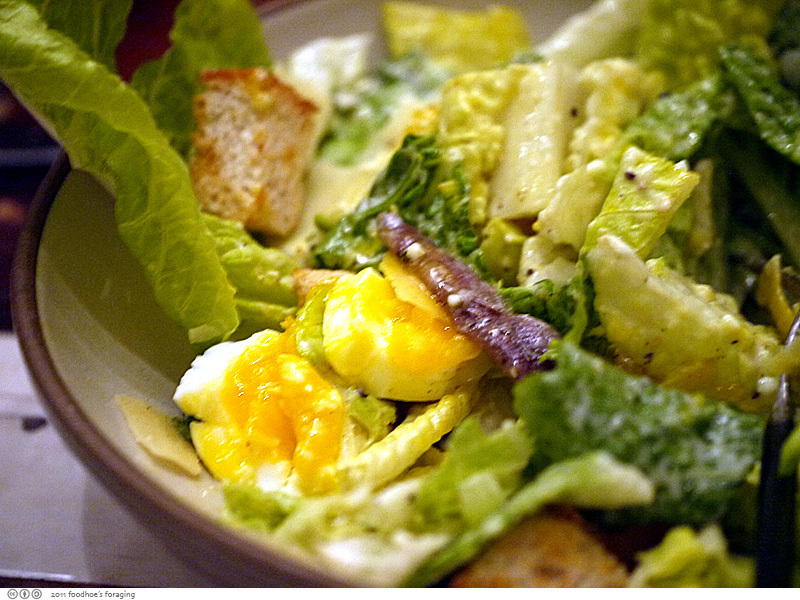 I ordered the Caesar Salad with soft boiled egg, which came lightly dressed and was draped with several pungent and briny anchovy fillets, a few crunchy croutons and tendrils of parmesan cheese. It was better than average, and I loved the soft boiled egg, which was a preparation I had never seen in a caesar… although I shouldn’t have eaten so much of it because my entree was humongous. 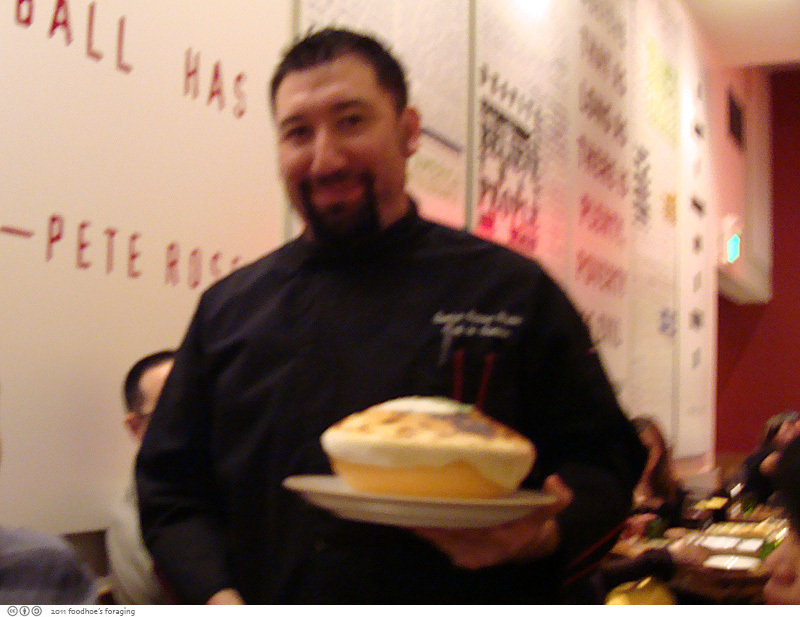 Chef Gustavo Romero arrived with the Sedanini alla Credo, which is their signature dish, an unsual combination of baked sausage-studded rigatoni, capped with a crisp, golden pizza crust. We oohed and asked him if this was his creation, but he told us that he learned how to make it from his mentor, Chef Mario Maggi, who opened the restaurant last year. 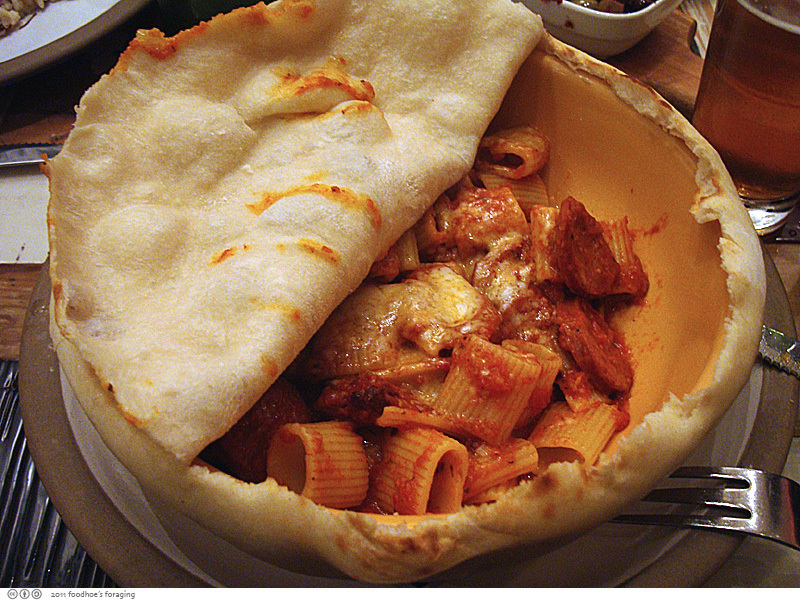 The pizza dough forms a seal around the bowl, creating a steam pocket that lifts the crust into a dome when baked. Chef Romero cut around the perimeter of the dough and peeled it back to reveal a steaming pile of sedanini pasta, which are short, wide macaroni tubes resembling celery stalks, baked in a spicy tomato sauce with pancetta, pecorino cheese and slices of spicy Southern Italian-style links that are flavored with a touch of fennel. I broke off pieces of the chewy crisp pieces of the pizza dough and munched that along with bites of the savory pasta. This was way more than I could eat, probably more than two could be able to finish! 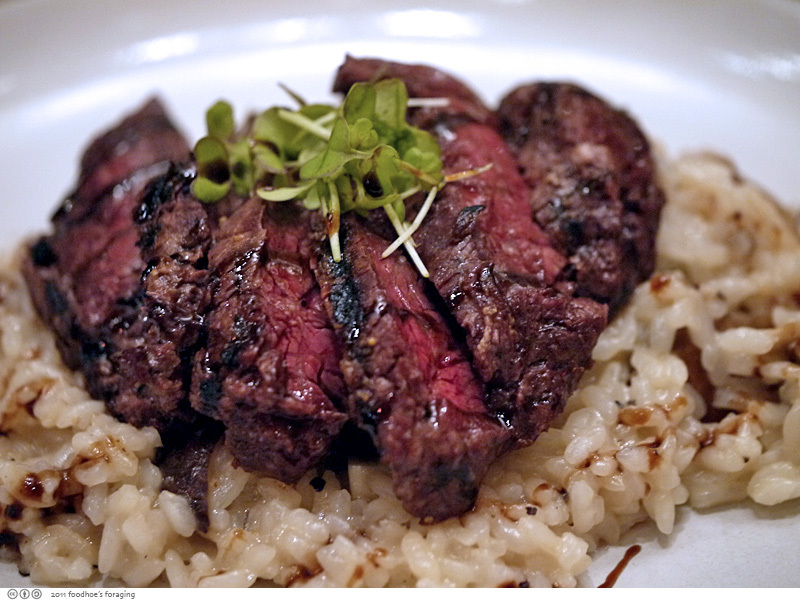 JT had the Grilled Hangar Steak, which was served over mushroom risotto that was drizzled with balsamic reduction. The meat was tender and juicy. 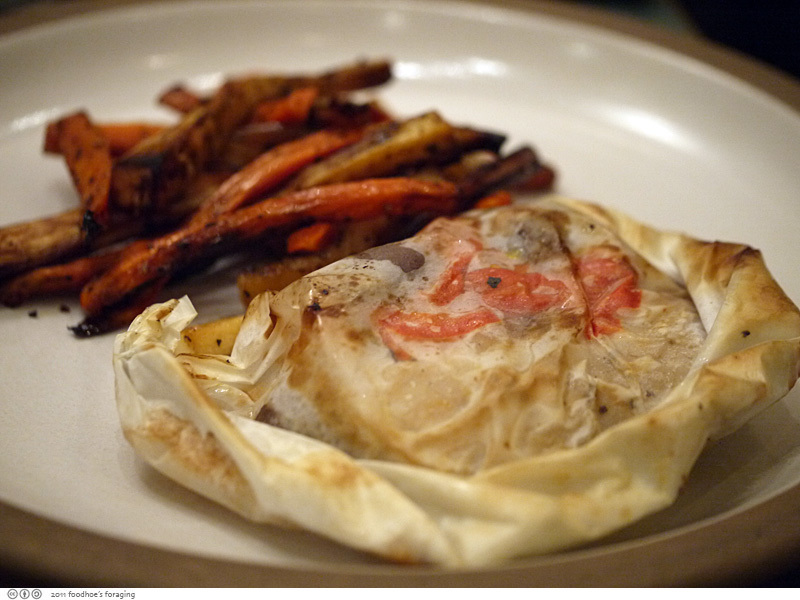 At first glance, it looked like it was wrapped in edible phyllo pastry dough, but it was definitely parchment that had browned while in the oven. 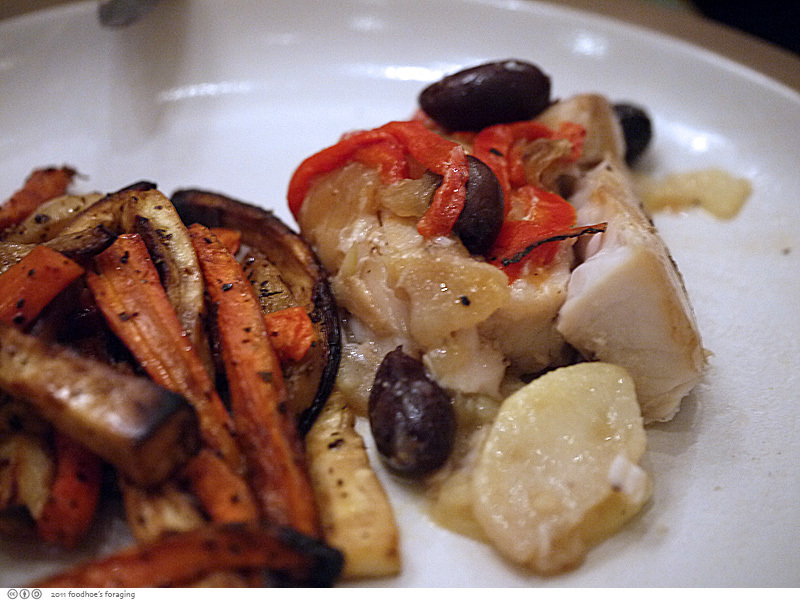 Inside, the perch was steamed and infused with the roasted vegetables, herbs and olives. 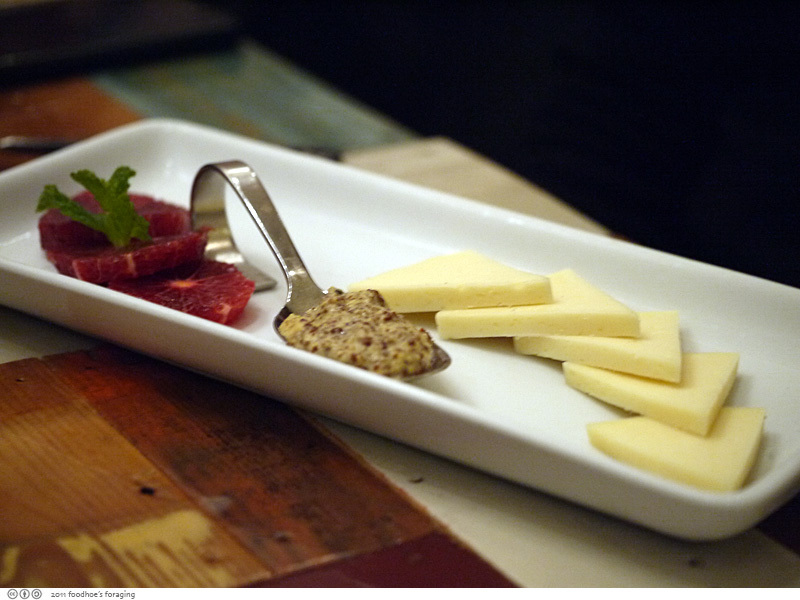 For dessert, I chose the Aged Fontina with seasonal fruit (blood orange) which was served with apple mustard, a coarse mustard mixed with thin slices of roasted apple. I would have liked more variety of either cheese or fruit. It was a flavorful combination, but my tastebuds were feeling a bit fatigued by this point and couldn’t face all of that mustard and cheese… so I stuck with the juicy slices of blood orange. 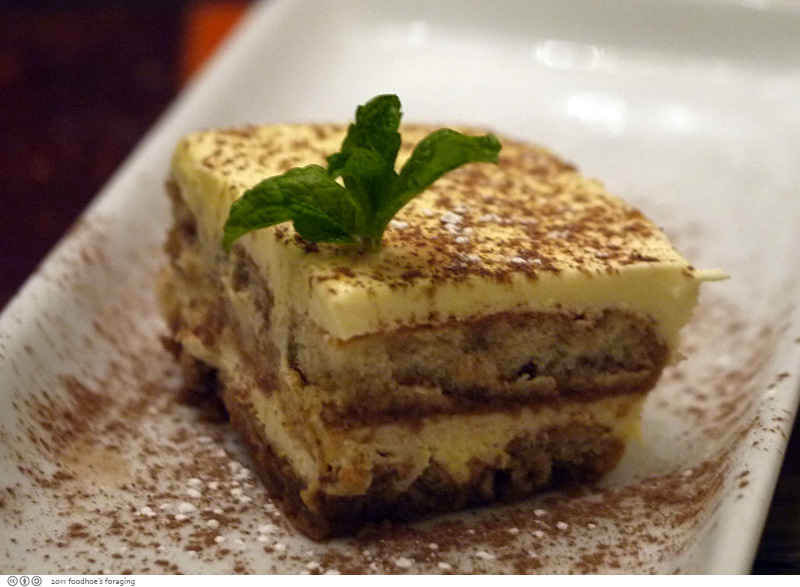 JT had the Tiramisu, which was rich and light at the same time, and felt so soothing that you could just keep taking bite after bite. 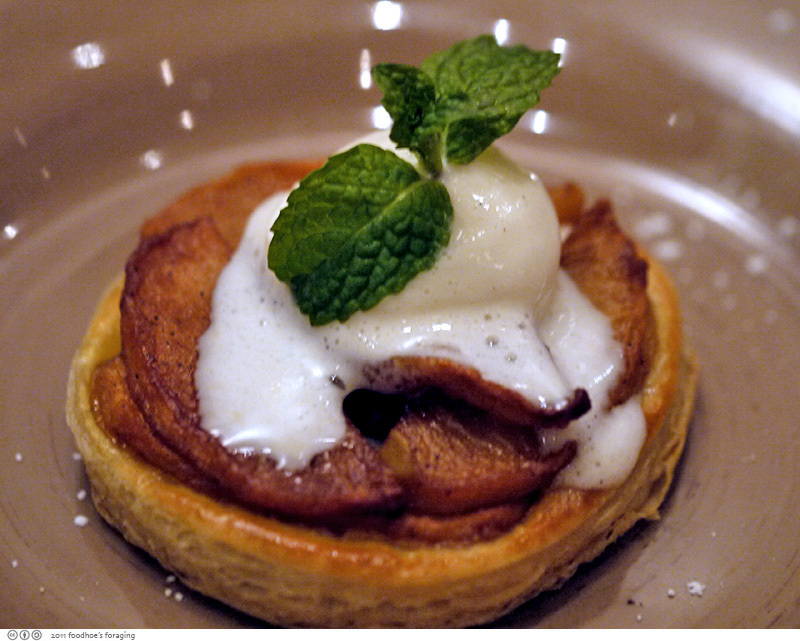 Daisy had the Apple Tart which was topped with a scoop of vanilla bean gelato. This was a light and appropriate end to our decadent feast! I brought most of the Sedanini home with me, which heated up very nicely the next day. I really liked that dish and can’t wait to go back and read the writing on the walls. I keep forgetting about DAT! Gotta check some of those places out! 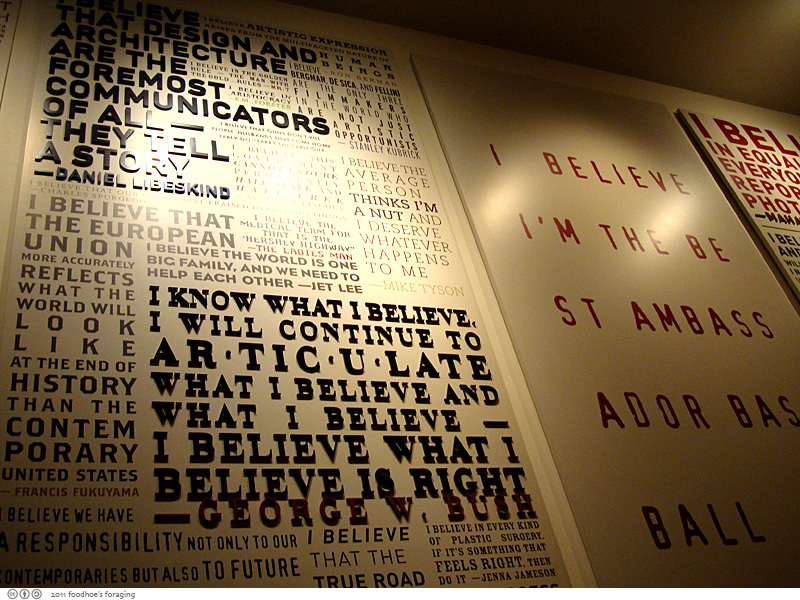 i love the idea of all the quotes on the wall, but that’s not the best thing–that sedanini looks like it’d be amazing! what a unique find. 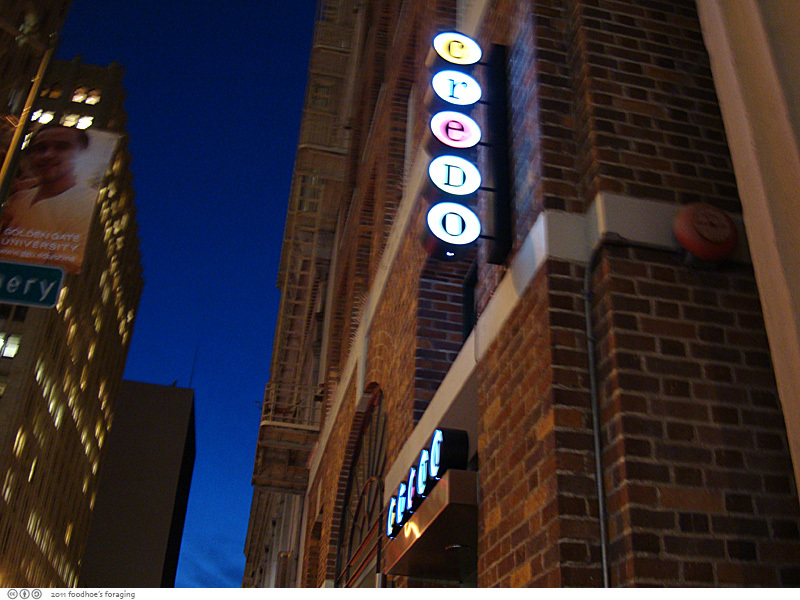 I had dinner at Credo a few nights ago. Food was delicious. I highly recommend their pizzas.